Metal cabinet, painted in a red and black snake skin motive, with gold coloured and white plastic ornaments and a mirror scale in three colours. Two 1.5 W loudspeakers, type 3GD-2, are placed on the left and right hand side of the scale. The big glass scale, as well as the red star above the scale are illuminated by two scale lamps (6 volts, 0.28 Amps). The wave length switch is situated below the scale. The tuning knob is mounted on the axle of the wave length switch. Antenna, earth as well as a connection for a gramophone and an extra loudspeaker are situated at the rear of the radio. After the death of Stalin, on March 5th, 1953, the Soviet Union wanted to show that the repressive period was over. A cautious start was made with the production of better household goods. During and after the war, the production of military goods was considered more important. 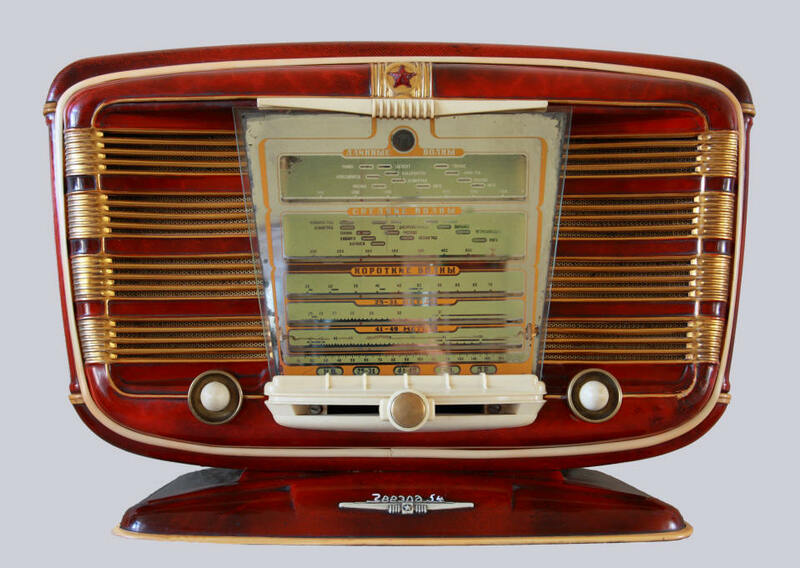 The radio is a copy of the French Excelsior 52 radio. In 1952 a group of Soviet diplomats was in Paris to negotiate the future status of Austria, then still occupied by the Soviet Union. An Excelsior 52 was given to this delegation as a present. There were many design problems. The metal cabinet caused resonance in the audible range (between 1000 and 3000 Hz), that is why the inside of the cabinet is covered with felt. This again led to higher internal temperatures. 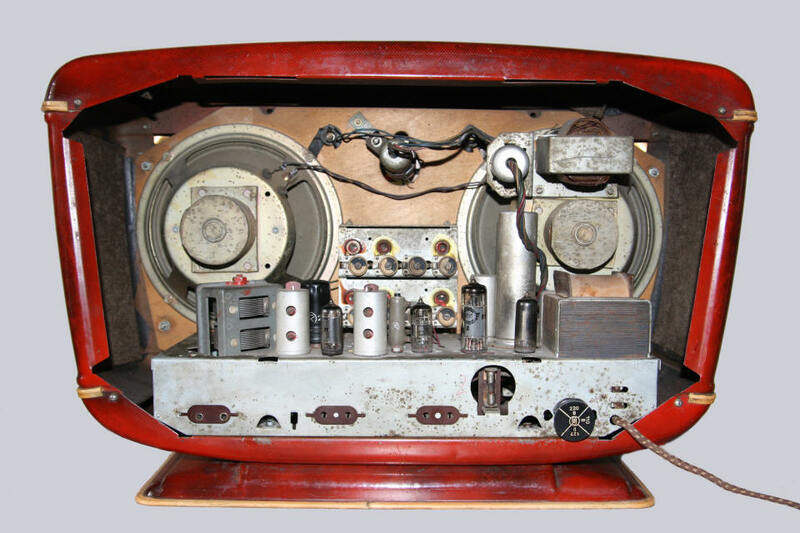 New loudspeakers had to be designed for the receiver as the quality of Russian loudspeakers was not very high. The production of miniature tubes had just started. These tubes were scarce and not all types were available. That is why an older tube like the 6A7 was used. Also its too "Western" and at the same time somewhat "vulgar" design, led to some resistance in the political leadership. 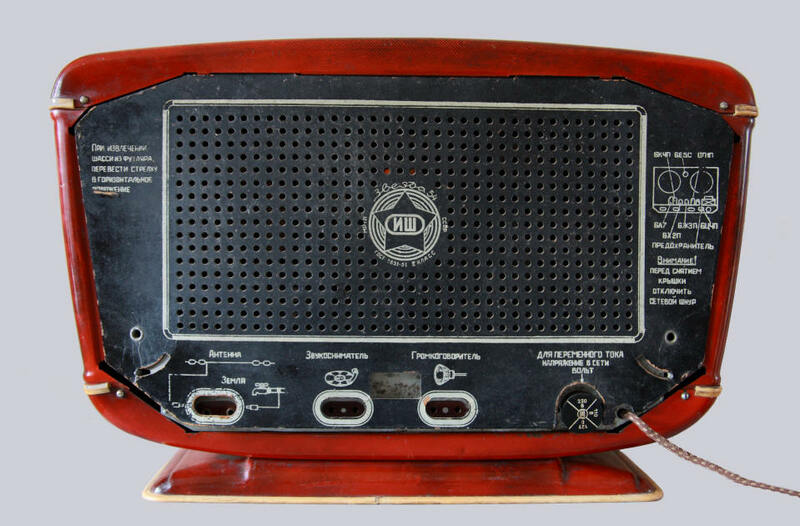 But because of its "bourgeois-capitalist" appearance the radio was very well received by consumers in the Soviet Union. Other radios of that period had rather drab designs. The radio is still eagerly collected. 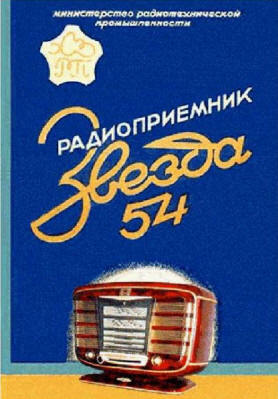 The "second class radio, Zwezda 54" (Star 54) was produced from the middle of the year 1954 until 1960 by two factories: Мосприбор (Mospribor) in Moscow and Коммунар (Kommunar) in Charkow. The logo "ИШ" on the back panel is a sort of trade mark for consumer goods. 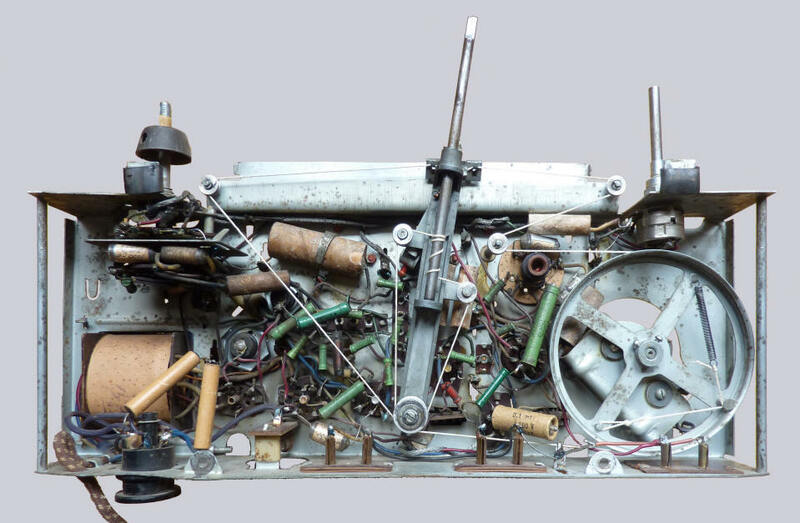 The first models (made in Charkow) had a vertical chassis; later models had a horizontal chassis. The cabinet was made in the colours red, brown and green. 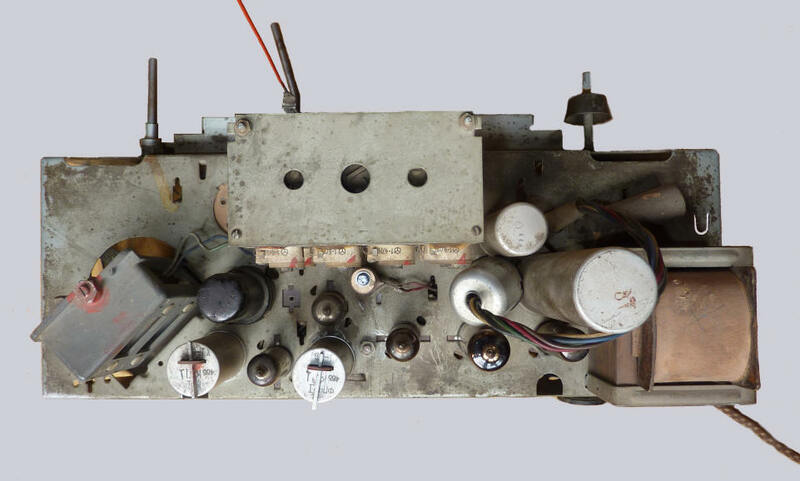 The knobs from left to right: tone control in six steps (three for gramophone and three for the radio itself), wave length switch, on/off/volume control. What was broadcast in 1956?